Newly updated the Blood Type, pH and Nutrition Charts are a valuable reference for tailoring your diet to the needs of your body. The chart comes in for versions, one for each of the different blood types, A, B, AB and O. If you don't know your blood type, blood typing kits are available. 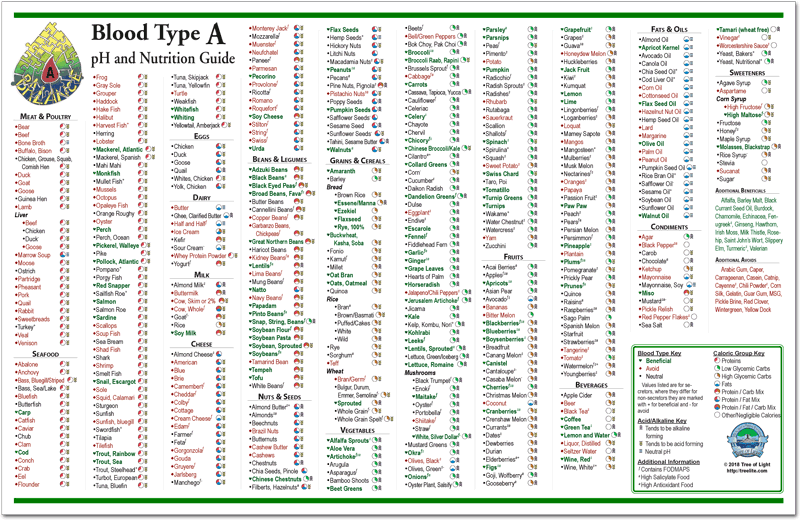 The information in each of these charts covers foods which are beneficial, neutral, or to-be-avoided for each of that specific blood type, which foods are acid or alkaline forming and information for zoning your food program (balancing carbohydrates, proteins, and fats for optimal health, glandular balance, and weight loss). The updated charts also include foods that are high in salycilates and foods that contain FODMAPs. On the back of each chart includes a short guide on how to use the charts as well as information the individual blood type. These charts are 11 inches by 17 inches and are laminated. Blood Type, pH and Nutrition Charts Great but we need some for Canadians! They are awesome reference charts but the back side only has the US name of the Nature's Sunshine products. Can you get some made up for Canadians?